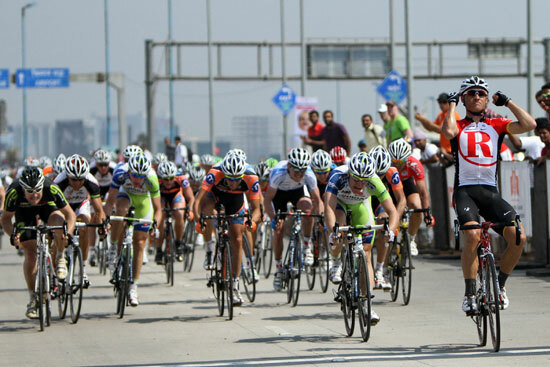 South African Robert Hunter won the second and final stage of the Tour de Mumbai today. He sprinted ahead of stage one winner, Italian Elia Viviani and Brit Jon McEvoy of team Motorpoint. His team-mate Robbie McEwen finished second to team Liquigas’ Viviani on Friday, but today McEwen was held back by a last-minute tyre puncture. Hunter won a stage at the Tour de France in 2007. Today, he led the charge along Mumbai’s Mahim Bay after 79 kilometres. “I followed Robbie Hunter as much as I could. It was a massive fight with Liquigas and RadioShack,” said 21-year-old McEvoy. McEvoy led a British sweep, taking places third through fifth with Endura Racing’s Ian Wilkinson in fourth ahead of McEvoy’s Motorpoint team-mate, Ian Bibby in fifth. Wilkinson, fifth on Friday in Nashik, anticipated the sprint after the final U-Turn at 300 metres to race. “It was just about 25 metres too far for me. After Scott [Thwaites] led, I saw I had to go. I dropped a few gears and started the sprint as the others were starting to charge. I thought I had third, but one or two pipped me. The second edition of the Mumbai race was a hot dog circuit. It ran along the Mahim Bay and over the Bandra Worli Sealink bridge, with the Arabian Sea in the horizon and Mumbai’s skyscrapers. Motorpoint and Endura Racing both had a man in an early escape group of nine: James Sampson and Jamie Moss, respectively. The escape, however, dissolved into the group led by the race’s only first division teams, RadioShack and Liquigas, in the final 7.2-kilometre circuit. Fans and local photographers delayed Wilkinson’s sprint and the race. After racing the first of the original circuits, race director, David McQuaid decided to neutralise the race. Police cleared the bridge of fans and photographers and McQuaid decided to cut out a risky section through the local slums.